Flaveria campestris J. R. Johnst. 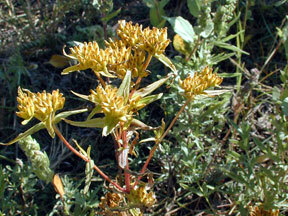 Also Called: Alkili goldentops, yellowtops. Stems: Erect or ascending, branched or sometimes unbranched below inflorescence, glabrous or sometimes hairy at nodes, finely ridged or grooved. Leaves: Opposite, simple, sessile, lanceolate, 1.2 to 2.8 inches long, 1/4 to 4/5 inch wide; surfaces glabrous; margins finely-toothed to nearly entire; tips tapering to sharp points; bases slightly expanded, wrapping around stem. Inflorescences: Cluster of 12-40 small heads, dense, terminal, sometimes resembling flat-topped panicles; subtended bracts 2, leaf-like. Flowers: Heads cylindric, 1/5 to 1/3 inch long; bracts 5, in 2 unequal series; inner bracts 3, primary, elliptic to oblong-obovate, 1/5 to 1/4 inch long, yellowish-green, glabrous; outer bracts 2, much reduced, to 1/8 inch long, greenish, calyx-like; ray florets solitary, inconspicuous, sometimes absent; disk florets 3-8, corolla about 1/10 inch long, yellow. Fruits: Achene, narrowly oblong-oblanceolate, to 1/8 inch long, somewhat flattened, 10-ribbed, dark gray to black, pappus absent, enclosing smalll seed. Habitat: Low waste places and disturbed sites. Distribution: South 1/2 and northeast 1/4 of Kansas.